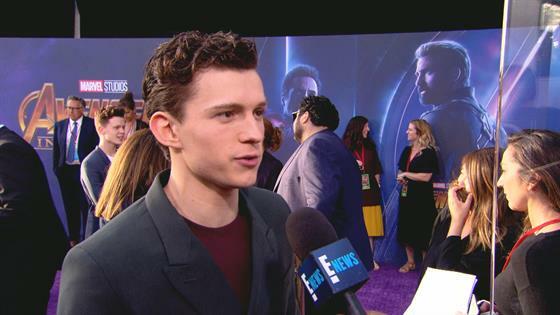 Tom Holland's spidey senses were tingling at the Avengers: Infinity War premiere. E! News' Zuri Hall caught up with the actor on the red carpet outside the El Capitan Theatre, where he admitted he was looking forward to finally seeing the blockbuster adventure in its entirety. "I'm just so excited to see this movie," said Holland, who'd just wrapped up a global tour. "I've been talking about the movie for like a month now and know nothing about it. I'm excited to see if what I was saying was just complete and utter bulls--t or in the right ballpark!" Working with so many A-list actors "was crazy," said Holland, whose character was introduced in 2016's Captain America: Civil War. "To be 21 and to get the chance to work with people like this is amazing," he said. "It was just a real whirlwind to walk on set and see 30 of your favorite actors dressed up like superheroes, just having a coffee and hanging out. It was so bizarre!" With Dave Bautista and Zoe Saldana in full body paint, and Mark Ruffalo in a motion capture suit, many actors didn't have time to change into their civilian clothes between takes. "Once you're in it, you're in it. They're the kind of costumes you can't take off. When we take our breaks, we're sitting in the green room drinking coffee. Some of us are trying to go to the bathroom. It's crazy," he said. "[With] my suit, there is no going to the bathroom!" In fact, he revealed, "You have to know when you go in it that you have at least three hours in the tank." Holland enjoyed working with Chris Pratt, as they'd never acted together before. "He's such a funny guy," he raved, "and he brings such a great energy to set." Working with Robert Downey Jr. again was another highlight, he added. "We've got such a great relationship over the years." "What I love about my job is I'm always getting to meet new people," the young actor told E! News exclusively, "and I'm just lucky that these are people I've looked up to for so many years."